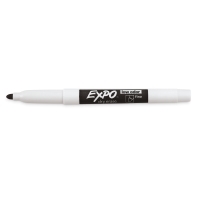 Use Expo Low Odor Dry Erase markers to track, schedule, and present your point in a brilliant fashion. 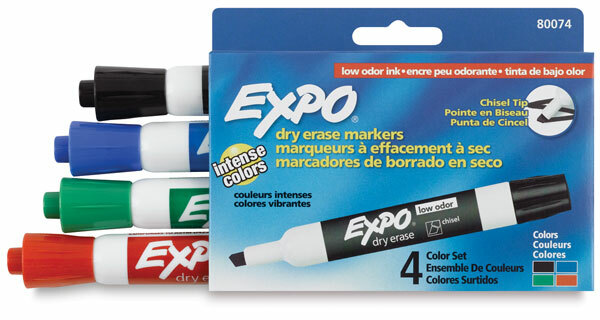 Intense colors can easily be seen from a distance and erase easily from marker boards. 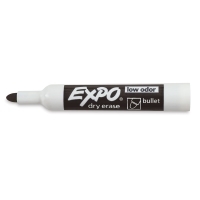 Specially formulated low odor ink is ideal for classrooms, small offices, and homes. Certified AP non-toxic. Conforms to ASTM D-4236. Assorted Colors, Set of 12, Chisel Tip — Includes 12 markers, one each of Aqua, Black, Blue, Brown, Green, Lime, Orange, Pink, Plum, Pumpkin, Purple, and Red. 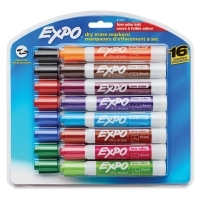 Assorted Colors, Set of 12, Fine Tip — Includes 12 markers, one each of Aqua, Black, Blue, Brown, Green, Lime, Orange, Pink, Plum, Pumpkin, Purple, and Red. Assorted Colors, Set of 4, Bullet Tip — Includes one each of Black, Blue, Green, and Red. Assorted Colors, Set of 4, Chisel Tip — Includes one each of Black, Blue, Green, and Red. Assorted Colors, Set of 4, Fine Tip — Includes one each of Black, Blue, Green, and Red. Assorted Colors, Set of 16, Chisel Tip — Includes two each of Black, Blue, Green, and Red, and one each of Aqua, Brown, Lime, Orange, Pink, Plum, Pumpkin, and Purple.